Greetings on this beautiful day! Reminder that the 730pm Class is on Thursday evening this week and next week, after that Wednesday evening will return again! Regarding the Yoga Hike – The weather is calling for possible showers so check your email or website before heading out. The rain date for our hike will be Saturday, May 31st, just in case. This is a beautiful chant that is an ancient verse from the Vedas, one of the original yogic texts that we have been chanting in class this week. 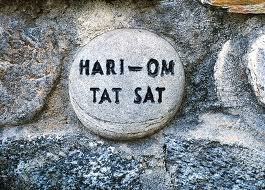 Hari Om Tat Sat: thus is not uttered casually, but is said when the speaker is in that ineffable state of Grace where : You, Me, everything, everybody, is permeated with a Divine, Spiritual essence. This chant honors that essence in the material and spiritual realms. It declares and acknowledges that Spirit infuses everything. Enjoy the day and choose to see Spirit infused in everything! !